An old English cider apple which arose in Martock, Somerset, England. 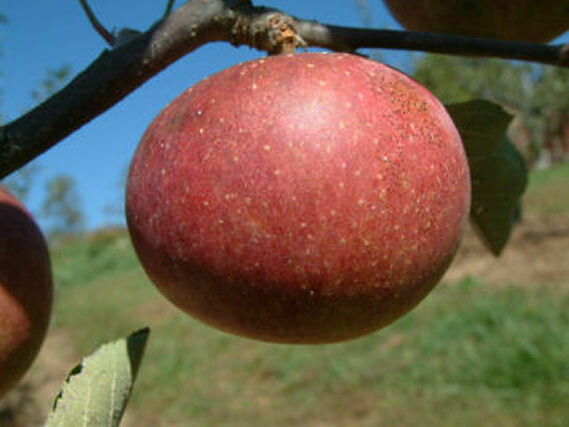 It is a small, greenish-yellow apple flushed with red and believed to be a seedling of Chisel Jersey. It produces a bittersweet, astringent juice which makes a soft, full-bodied vintage cider. A very aromatic apple which can be picked in November. We should have no problems grafting 20 Foxwhelp for 2015 but may not be able to graft that many Dabinett. Our only Dabinett tree is a very small replacement we transplanted two years ago which does not yet have a lot of growth from which we can collect cuttings. We can probably obtain extra wood from other sources but may still not have enough to graft 20 trees. Regardless, we’ll do our best. You should not have any problems with proper pollination for all your trees. Even though there is a slight difference in the bloom times, there is enough overlap in the bloom period to ensure full pollination. With all the other trees you will eventually have, successful pollination will not be a problem. Hope this helps. Thanks again for your business.